Pumpkins are fun to decorate but sometimes they are even more fun to eat! I like making pumpkin food from fresh pumpkin. You can peel, cube and boil pumpkin but I find it easier to cut a cooking pumpkin in half, put the halves face down on a rimmed cookie sheet with a layer of water and cook for about 30-40 minutes. Then you can just scoop the pumpkin out of the skins. A small cooking pumpkin will produce about 3 cups of cooked pumpkin. 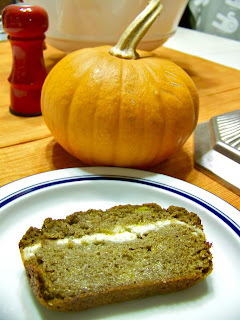 From there you can use the pumpkin in any recipe you want. This time around I decided to make a gluten free pumpkin bread with cream cheese filling. 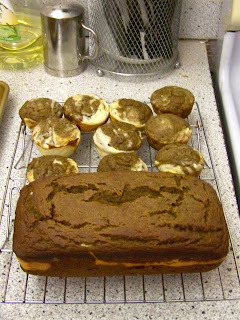 I didn't have two bread loaf pans so I made one loaf and about a dozen muffins. For the Batter: Mix the pumpkin, applesauce, egg, and egg whites until smooth. In a separate bowl, combine the flours, sugar, baking soda, cinnamon and nutmeg. Slowly mix the flour mixture into the pumpkin mixture. For the cream cheese filling: Mix the cream cheese, sugar, vanilla, egg whites and flour until creamy and smooth. 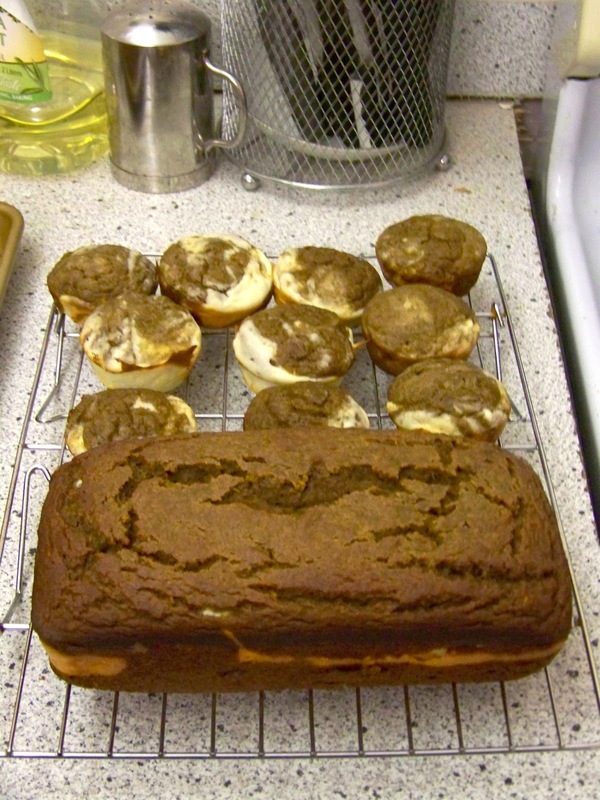 Grease 2 8x4x2″ loaf pans or a loaf pan and a muffin tin. Put a layer of batter into each pan. Pour half of the cream cheese filling in one pan and the other half in the second pan and smooth with the back of a spoon. Top with the remaining batter. 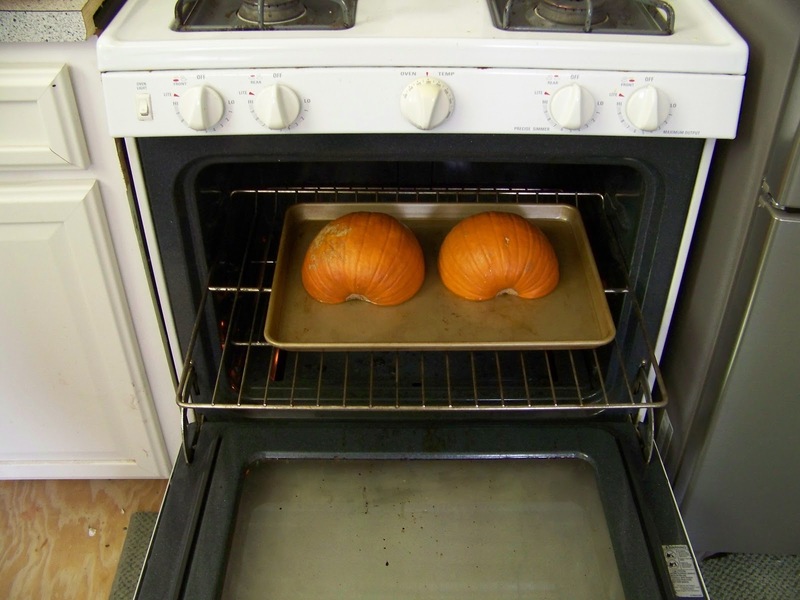 Bake in a 350˚ oven for about 40 minutes, or until a toothpick inserted comes out clean. Remove from pans and cool on a rack. Store in the refrigerator in an airtight container. The flavor of these really come out after completely cooling and being refrigerated overnight. I'm not exactly sure why, but these tasted bland at first but the next day were great!